As metal detector enthusiasts discovered in Dewey Beach months ago, the sand pumped to shore by the dredges contains military bullets and shell casings. The dredges haul the sand to Rehoboth and Dewey from the ocean floor southeast of the Indian River Inlet, about three to five miles from the beach. (Track the dredges' locations at: http://henney.com/sp). Most of the bullets and shell casings are .50 caliber, although at least two metal detector users reported finding smaller rounds. Several beach visitors said they found some bullets and casings without the use of metal detectors. Pictured below are several bullets and casings I found this past week with my Fisher CZ-6 metal detector. One shell casing is stamped "U T 42" which suggests it was produced by the Utah Ordnance Plant in 1942. Click here for common head-stamp codes. BEES SWARM IN FRONT OF DOLLE'S! Bees were swarming in front of Dolle's on Rehoboth Avenue so badly that police put up "POLICE LINE DO NOT CROSS" tape Saturday around the affected area. The bees appeared to congregate in the pine tree pictured below. One officer said there were hundreds of bees around this tree. Although the bees are not obvious in this picture, they are there! Some bystanders may have thought a girl had almost drowned Saturday when she appeared to have trouble along the surf. She apparently suffered a seizure and became disoriented near Norfolk Street. Lifeguards were already on the scene when somebody called 9-1-1 for assistance. Medics, police and ambulance crews responded (below). The girl did not go to the hospital by ambulance. A similar incident happened Sunday around 2:10 p.m. when a 10-year-old boy suffered a seizure and went under the water in the Cape Henlopen State Park. A lifeguard assisted the boy and reportedly briefly performed CPR. Amazingly, the child was conscious when the Lewes ambulance arrived. He was taken to Beebe Hospital in good condition. VEHICLE TOWED FROM STOCKLEY STREET LIFEGUARD SPOT, AGAIN! Lifeguards called for police assistance on both Saturday and Sunday when vehicles were found in the lifeguard parking space on Stockley Street. Police towed this Jeep Sunday afternoon. A resident talking with police expressed concern about the marking of parking spaces along the street. She said she suspects people do not realize that the sign applies to both parking spaces. Notice how the sign appears to the right of the white line, but has two arrows. People may assume that the left and right arrows refer to the same space. More unauthorized vehicles were towed from this lifeguard parking spot last summer than any other. A beach replenishment worker in front of the Star of the Sea explains to a woman to keep off the new dune. 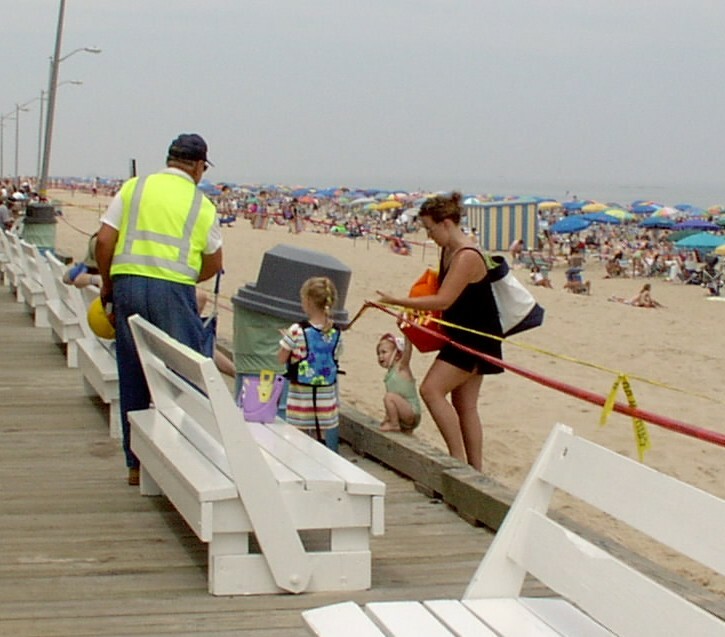 Rehoboth Beach police, lifeguards and the replenishment team chased beach visitors off the new dunes for the past week. But beach goers continue to cross the dunes probably because they are not "taped off" along the beach side. Only the boardwalk and cross-over locations are clearly marked with CAUTION or DANGER tape. The two central air conditioners in the temporary offices for the Rehoboth Beach building & licensing offices run continuously, all weekend and all night long. This has been the case since the double-wide office space was installed behind the firehouse last summer. One of the office workers indicated that the thermostat/thermometer inside the office does not operate properly. A few weeks ago it was comfortable and cool inside the double-wide, but the thermometer inside showed 85 degrees and the thermostat was set to 72 degrees. 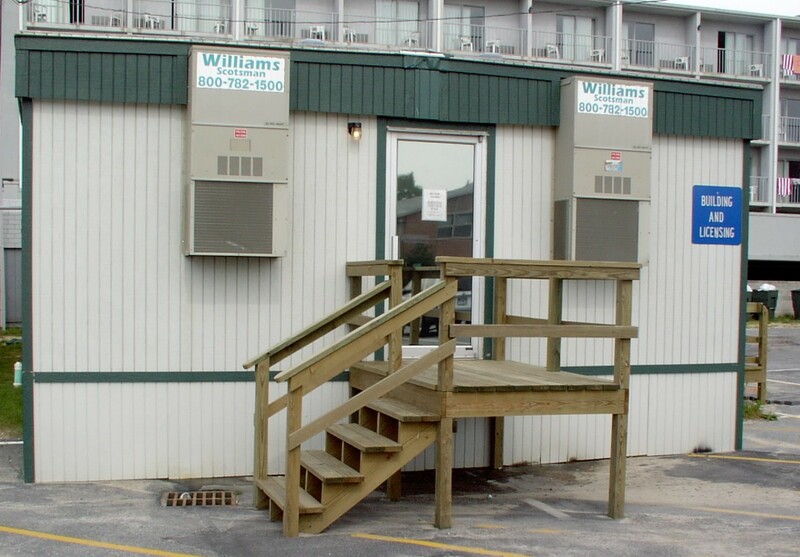 Note the puddle of water beneath the units (below, right). Also, although hard to see, the light to the left of the door was left on. The two air conditioner window units in the "water shed," the red brick building next to this building, run continuously as well -- even when the parking enforcement personnel are not working. 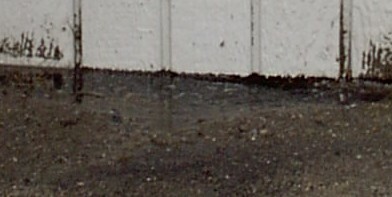 The "water shed" is used to store parking meters and related equipment.